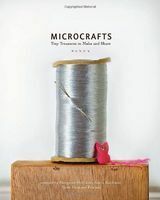 We've got four copies of Microcrafts by Margaret McGuire up for grabs which is filled with tiny treasures to make and share. We've also got a sample project from the book for making your own Temporary Tattoos. For your chance of entering, simply leave a comment below telling us what you'd like a temporary tattoo of? Congratulations to our winner Tifer. really sweet projects. Kitty and owls whip up fast,great little package decorations or quick cheer me ups. Mine would be a lion with the leo sign on it. I'd love a Temporary tattoo of the Rocky logo! Either my calligraphy logo (profile pic) that I got at a craft fair, or the symbol I made for myself. I would like a temporary tattoo of a tiny cute cartoon mouse with big whiskers, wearing big glasses. I have a cpl real tats but my hubby has none, i would put one of a dragon he likes on his forearm- so he can see if he likes it enough to go permanent. my kids would want to be "zombiefied" and i would try different stuff to see if i want any other real ones. I have real tattoos. But sometimes I want to play around with having more. Right now I'd like temporary tattoos of lace fingerless gloves on my hands! I would love a tardis that's making little *vroom* sounds, so that as the tattoo fades, I could pretend that the tardis was teleporting somewhere. Or... a moustache tattoo for the next movember. Because I can't grow my own. Or... a little pink ribbon tattoo for brest cancer awareness next october. I would love to have a tattoo for every occasion, for myself, and as gifts for my friends. I'd like a tempory tatto of the dark mark...that'd be AWSOME! I would loveeee a temp. tattoo of the deadmau5 head and srkillex! i <3 them! I'd love a Batman-inspired tattoo! a Sugarglider. They are tiny & cute, so making them tinier would make them cuter. right? I'd love a lion or a tiger tattoo. Dragons are my ultimate fav, so something with a flying dragon would be great! I would love the dark Mark on my arm because I am a MASSIVE Harry potter maniac!! That, or little wings on my back. I'd like a temporary tattoo of the ponies from 'My Little Pony', so I could see how it looks before getting the permanent ink! I'd like a mustache tattoo! The Dark Mark from Harry Potter, or the words "Chase the Morning" "Free at Last" or "Chromaggia" from the movie Repo! The Genetic Opera. I'd like to do a mock-up of the Raven Feather Tattoo I'd like to eventually have permanently. I would get "Hate and War" on my back as a tribute to Joe Strummer, The Clash and music in general. i would like a mirror so every time i look at it i will be able to look at my self and think " i wouldn't change for anyone but me"
I want a temporary tatto of a salamander with its tail twisting around my thumb or one of my poodle on my ankle. a big dragon with its wings open breathing fire to go on my back. tribal style like the one on my arm. I'd like a temporary tattoo of a rat, in memory of Rateesha (the rat in my pic). I'd like a temporary tattoo of a unicorn. Or a rainbow. Or Hello kitty. i would like a temp. tatto of my face....no that would be just a bit creepy?! then totally a mustache on my finger!!!!!!!!! A tattoo of the spinning rainbow wheel of death that Mac computers get when they lag would be rather sublime. I would love a tattoo of the Deathly Hallows symbol. that would be amazing. I love tiny things. This book looks like a perfect companion for creating teeny tiny items. A tiny tattoo of a dragon flying would be my choice. i would love a tiny little bluebird! or a thistle flower. I would love a temporary Tyson Tattoo. For me, it could only be fun if it was temporary. For some poor slob who was unfortunate enough to pass out drunk around me...well, it is still funnier when it's temporary! I would like a temporary tattoo of a heffalump and/or woozle. I would love a temporary tattoo of my company's logo so I could make my coworkers think I had gone off the deep end. I'd make temporary tattoos for my girls using their own drawings. They'd love that. I'd want a mustash temporary tattoo on my index finger!!! I have always thought that was such a brilliant idea and cleaver too. But I would never be able to stand the pain lol. So temorary ones would be amazing. Or I'd want a baby's foot print on my belly when I finally get pregnant, ive seen the idea on baby shower cakes, it looks like the baby is kicking! So cute for a mommy to be who wants to show off her baby bump! I'd like a temporary tattoo of a bunny with a top hat. Or even better, I'd get the words from daft hands temporarily tattooed on my fingers. I'd love a temporary tattoo of a dandelion, with some of the seeds floating away! A blue Lotus blossom would be awesome. If i were an animal i would like to be a butterfly, so that would be what i would want as a temporary tattoo. For me the butterfly stands for freedom, besides i have always wanted the ability to fly. I would like a temp tatoo of one of my mini-watercolor paintings! I would like a tattoo of "Captain Jack Sparrow's" Sparrow, because I think Johnny Depp gets sexier every time I see him. I'd like a temporary tattoo of a button or sewing needle to remind me of all things arty and crafty - not that I would need reminding though! I'd love a cute ladybug, nothing too buggy-looking though. Or, a sweet cherub angel. It's hard to say what I'd like a temp tattoo of because I have real tattoos. But my kids would love a bulldog and ballerina. I would like one of baby foot prints to reminde me of my two beautiful girls. I love unique tattoos. swirls with dots, sparkles and fairy dust. Or my son loves anything camouflage... so he would love a design that had camo in it. My daugter would love a pink monkey or a pretty fairy. I would like a tattoo of either a small hedgehog or sock monkey. My daughter's name is Margaret McGuire! Thank you.